Trying something new can feel a little scary and intimidating. Not to worry! In Episode 14 of our podcast, I share everything you need to know about Getting Started With Yoga. If you're new to yoga, please give it a listen, then let me know if you have any lingering questions or concerns. And if you know someone who's interested in trying yoga, please help them out by sending this to them! 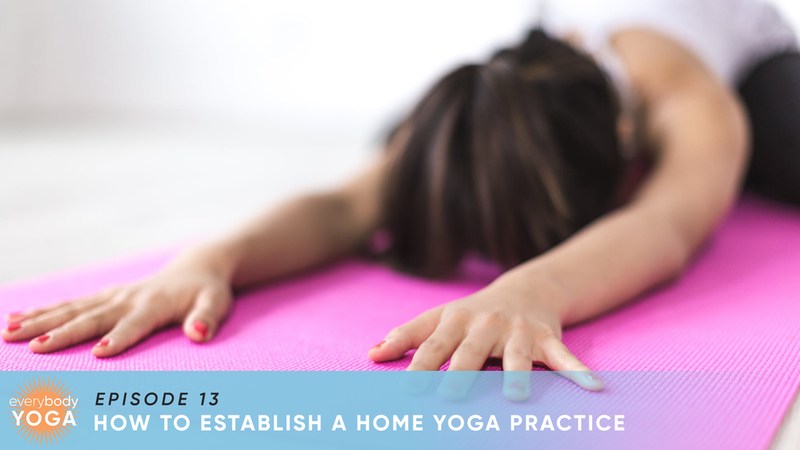 Have you ever tried to practice yoga at home and felt that the endeavor was less than successful? When you step onto your mat at home, it's easy to get distracted by a sinkful of dirty dishes or a pile of laundry that needs to be folded. Maybe your pets think it's playtime when you lie down on the floor, or perhaps the challenge is figuring out which poses to do and in which order to do them. In Podcast Episode #13: How to Establish a Home Practice, I explain where, when, and what to practice at home. Plus, I share a couple of important tips from yoga philosophy that will surely keep you motivated you as you get started. Click here to listen via our website (it's easy!). You can also find us wherever you normally get your podcasts (search for EveryBody Yoga Podcast). If you'd like some in-person guidance about your home yoga practice, please consider joining me at my workshop, Establishing a Home Yoga Practice, next Saturday, May 5, from 2:30 - 4:30 p.m. We currently have 10 spots still available. You can register online here, register in person at the studio, or call us to register over the phone (512-318-2112).